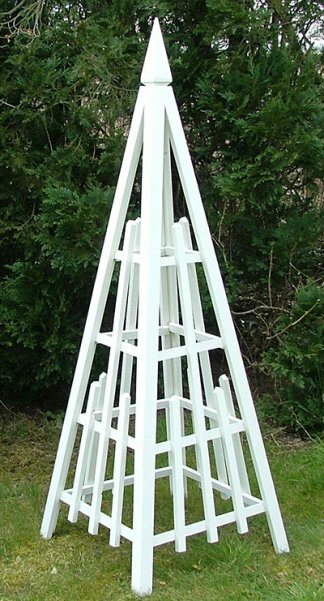 This striking Spire Obelisk is constructed from Scandinavian Red Pine. Its main vertical timbers are 35mm square and all connections are doweled and bonded with high quality waterproof adhesive for durability and strength. 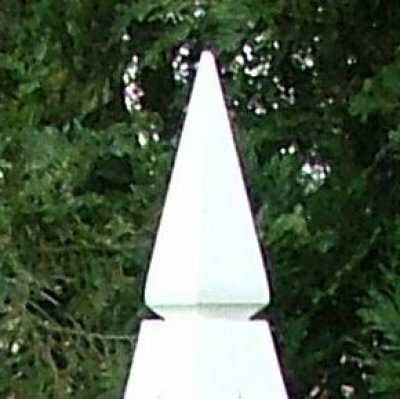 The Spire is an elegant garden Obelisk that stands 170cm tall and is 53 cm square at the base. Using obelisks as architectural elements in your garden is a technique used by designers to add structure to the most sophisticated of flower gardens, the effervescent informal cottage garden, or the kitchen garden. dull and dreary winter garden. Come the springtime your plants become alive, twining themselves around the legs and the cross struts, bringing the obelisk to life, with clematis, roses or the vines that you have chosen to plant around the obelisk. Wooden Garden Obelisks are, for me, the ideal. Beautiful and (ours at least) strong. I don’t think there is anything more beautiful than timber, which also has a natural affinity with all garden plants as well as being the only material that is a renewable resource used for the manufacture of Obelisks. So about as green as you can get.